As one of the hero products in Golden Bear’s In The Night Garden collection, Lullaby Igglepiggle is one of a growing range of interactive toys for children as young as 10 months old. A simple press of the sensor in his hand activates a variety of musical tunes, whilst another button also makes his rosy cheeks glow in changing colours. Lullaby Igglepiggle can sway from side to side in time with a comforting lullaby, all the while holding his reassuring soft red blanket. Made from a beautifully soft plush pale blue fabric, the toy is 30 cm tall when in the sitting position. Igglepiggle is the perfect companion for any little one to drift off to sleep with. Youngsters will love cuddling up to him and by pressing his hand they will hear soothing lullabies whilst Igglepiggle gently sways and his cheeks glow softly in different colours. 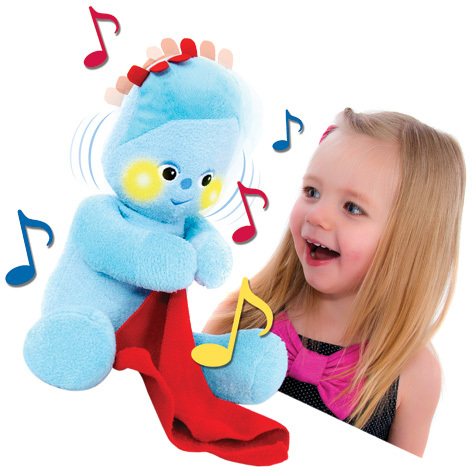 Please tell us what you think of Lullaby Igglepiggle by Golden Bear.